The cosmic ray spectrum extends to extremely high energies. Giant air showers have been observed with energy exceeding ~1011 GeV. 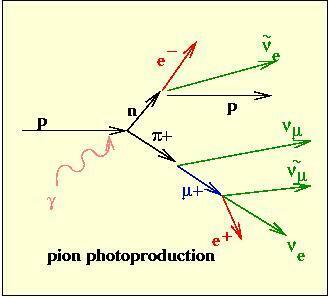 Energy losses due to interactions with ambient photons can become important, even dominant for such energetic nucleons, above the threshold for pion production. 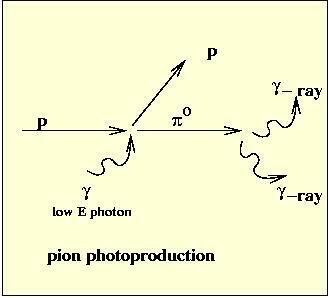 Photoproduction of hadrons is expected to cause a distortion of the ultra-high energy cosmic ray (CR) spectrum by interactions of the nucleons with the microwave background (the Greisen-Zatsepin-Kuzmin cutoff), but it may also be relevant to the observed high energy gamma ray emission from jets of Active Galactic Nuclei (AGN) or Gamma-Ray Bursts (GRB). Moreover, it is the major source process for the predicted fluxes of very high energy cosmic neutrinos. The photohadronic cross section at low interaction energies is dominated by the Delta(1232) resonance. Since the low energy region of the cross section is emphasized in many astrophysical applications, the cross section and decay properties of the prominent Delta-resonance have often been used as an approximation for photopion production, and the subsequent production of gamma rays and neutrinos. As discussed in e.g. Mücke et al. 1999, this approximation is only valid for a restricted number of cases, and does not describe sufficiently well the whole energy range of photohadronic interactions. A more sophisticated photoproduction simulation code is needed to cover the center-of-mass energy range of about s1/2~1 - 103 GeV, which is important in many astrophysical applications. This was the motivation for developing the Monte-Carlo event generator SOPHIA (Simulations Of Photo Hadronic Interactions in Astrophysics), which we wrote as a tool for solving problems connected to photohadronic processes in astrophysical environments, but can also be used for radiation and background studies at high energy colliders such as LEP2 and HERA, as well as for simulations of photon induced air showers. The philosophy of the development of SOPHIA has been to implement well established phenomenological models, symmetries of hadronic interactions in a way that describes correctly the available exclusive and inclusive photohadronic cross section data obtained at fixed target and collider experiments.